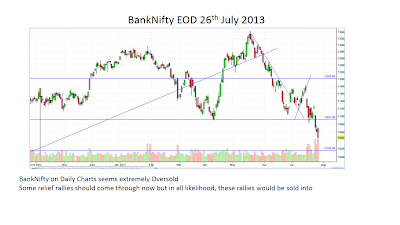 So the upside targets have been achieved on Nifty but not on BankNifty. 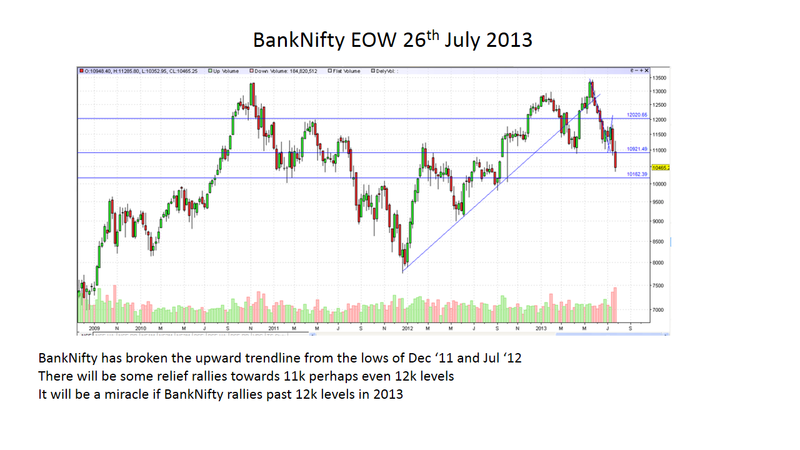 BankNifty not only broke down 11k levels but went all the way down to 10400 levels. Historical data from 2011 suggests that 10400 has been an interim samaritan for bulls because once 10400 breaks, within 3 months of that, BankNifty cracks a further 2000-2500 points. Upside for now seems capped and in all likelihood interim tops are in place. So where do we go from here? Bearish: A top is in place and the last corrective wave to the earlier tops [6357 in Jan '08 and 6338 in Nov'10] is unfurling for downside targets of 4373-4531-4770. 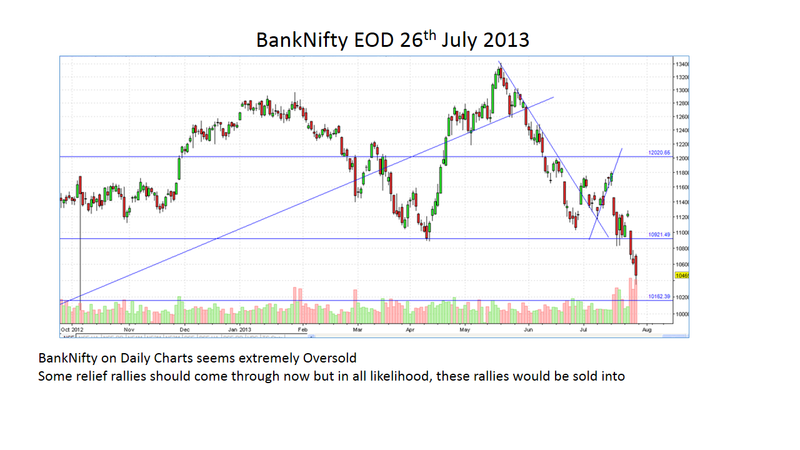 This possibility is negated with 2 consecutive closes above 6280. 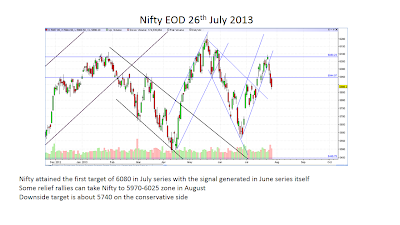 Please note that even if this view is correct, the time and price patterns of the correction will be similar to that of the fall from 6338 to 4531 in Nov'10 to Dec '11 period i.e. 13 month correction with 3 strong relief rallies in between. I am leaning to this possibility unless negated. As was proved in that corrective period, blind shorting never paid off. One has to look at Resistances / Support Breaks before creating shorts. And also as a trader one should buy into relief rallies or stay away. The reason why I am getting more inclined to this view is the form of the corrective wave. Within this C wave [which will unfurl as a 5 wave pattern] the 2nd wave is very very deceptive. 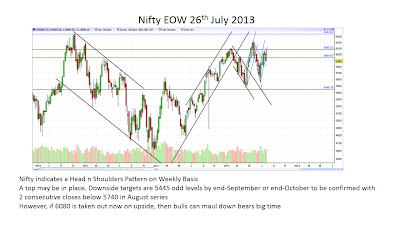 It deeply retraces the first wave and is full of deception for both bulls and bears. So far this story has played out. After hitting 6200 levels and going down all the way to 5566, a pullback came in to almost 6100 levels. 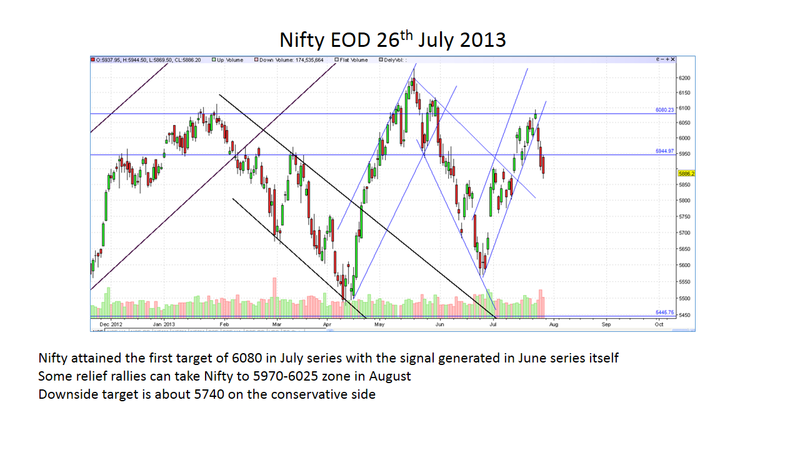 Now as long as prices stay within 6100 levels, the next leg down can be very lethal. 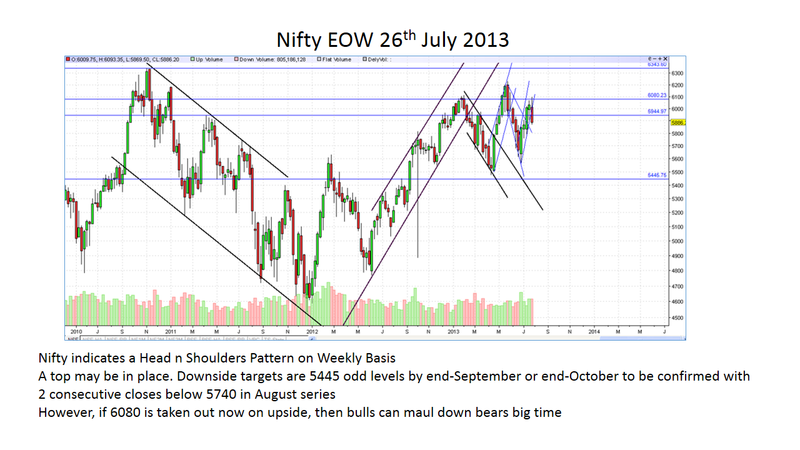 Adding credence to this view is the Head and Shoulder pattern on the Weekly Charts of Nifty. However, as many senior and wise people say, prediction is one part but trading / investments should follow price action. HUL: Fundamentally, the stock has less delivery volumes in outstanding shares in the market. P/E Multiple Value: Using 35 PE due to steady performance and dividend payouts, EPS is about 17.5 giving a fair price estimate of 600. Currently the stock is trading at a 40 PE multiple which is excessive even with the consumption story. The growth is not going to be perpetually north and higher the base, the greater the difficulty in achieving growth. Going by the same logic, Dabur, ITC, Nestle, Asian Paints etc are all going through euphoria and maniac price actions. We have seen what happened to Wockhardt within a span of 12 months. The same thing can be expected on all these consumption theme counters as well though the proportion of falls may be less severe. No matter what the current euphoria in the IT pack, the fundamental macro-indicators show that they will fall severely once the rupee starts appreciating and work permit and taxation rules get more stringent in the developed economies. Gold / Silver in Dollar may have found their bottoms; nevertheless, in rupee terms, difficult to see the bullion go below 23k per 10 grams and silver below 35k per kilo. The dips should be used to buy for buying in physical/electronic forms. Crude Oil: There is a temporary aberration with Nymex n Brent both prices converging in dollar terms. I track Nymex in dollar terms and the range for the next 18 months is $65 / Barrel and $120/Barrel with 70% instances towards $100 / Barrel. In rupee terms, with 90% dependence on imports and a 5.5k crore rupee annual subsidy burden, petrol is headed to 150 per litre over the next 5-7 years [5 years if UPA government comes in and 7 years if NDA government comes in power in 2014] As I have been repeating time and again, gold imports is not a big drag on Indian economy but crude imports is. Now we have petroleum ministry reiterating that in-house gas fields should be developed. That is a very wrong way to address the problem. When the government is okay to provide subsidies, the subsidies should be extended to clean and green energy sources like Wind Power and Solar Power. The advantage of this being that these subsidy measures will be a one-time drag measures than perpetually subsidizing imports and hurting the exchequer. On the new banking licenses, the government is going over-ballistic on new licenses. The order of the day is to consolidate existing banks and ensure that they are well-capitalized. With consolidation, the pension burden will decrease drastically and also one will gain economies of scale with higher productivity of existing staff members. As far as the RBI measures to control the tsunami on the rupee is concerned, it is moving in the right direction. As it happens in global markets, too much liquidity in the system is not resulting in transmission of benefits to the common man and SMEs. 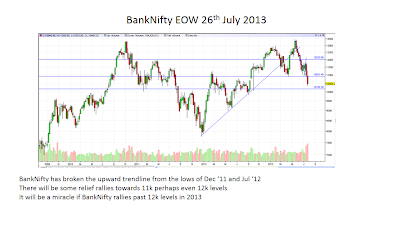 Most of the injected liquidity finds its way to the capital markets and predominantly in the Futures n Options space. With more and more FTAs being signed with ASEAN partners, it may be prudent to peg rates in local currencies and do away with dollar settlements. The prime need of India right now is to minimize the demand for dollars/euros/pounds to the greatest extent possible. There is a lot of correction pending in global equities that should accelerate by end-September. 22nd September is Fall Equinox and Germany's Merkel re-election verdict is expected by 24th September 2013. So lots of action awaited around this time-period.